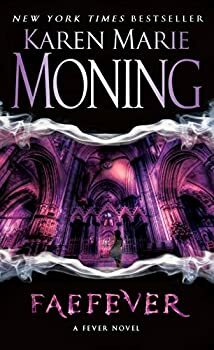 Karen Marie Moning is the internationally bestselling author of the Highlander and Fever novels. Her books have appeared on the New York Times, USA Today, and Publishers Weekly bestseller lists, and have one numerous awards, including the prestigious Rita. She lives in Georgia and Florida with her husband Neil and the world-traveling cat, Moonshadow. Here’s Karen Marie Moning’s website. Click here for more stories by Karen Marie Moning. Modern Seattle: Ravishingly gorgeous Adrienne de Simone (whose every body part is “perfect,” though she doesn’t know that) hates beautiful men because she just had a bad experience with the gorgeous man who was her fiancé. Never! Never again! Medieval Scotland: Sidheach James Lyon Douglas, otherwise known as “the Hawk” (even his mother calls him that) or “the King’s Whore,” is the hottest laird on the Highlands, but he’s never met a woman he could love. Every one of his body parts is “perfect” and he knows it. Darkfever: MUST. HAVE. BOOK. TWO. NOW. 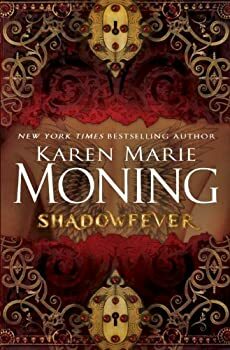 Karen Marie Moning’s Fever series can usually be found on the romance shelves, but having just finished reading the first installment, Darkfever, I’m more inclined to classify it as urban fantasy. 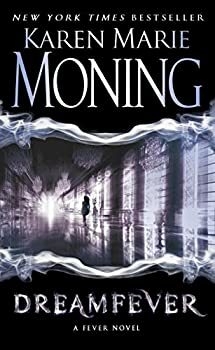 While there are a couple of men foreshadowed as possible love interests for the heroine, and while there is some sexual content (most stemming from the mind-control powers possessed by some of the fae), the primary focus is on a murder mystery and on the magical goings-on in Moning’s Dublin. 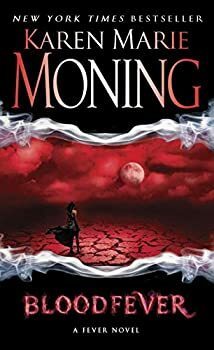 The series also follows urban fantasy tropes in another significant way: it is written in first person and follows one heroine, Mackayla (“Mac”) Lane, throughout its five books rather than featuring a different heroine and hero in each volume. At the end of Darkfever, Mac learned the identity of her sister’s mysterious lover (and possible murderer), but didn’t get the chance to strike against him. She’s still out for revenge, and Barrons still wants her help finding the Sinsar Dubh, an ancient book of evil magic. Meanwhile, Mac has to deal with too-curious Garda officers, the ever-present threat of Shades, and the machinations of the alluring Fae prince V’lane. Then, in addition to the Shades and Rhino-boys she’s now accustomed to, Mac starts seeing another frightening figure. One in dark robes, carrying a long scythe. Is he an omen of Mac’s death, a manifestation of her guilty conscience, or something else entirely? Throughout the Fever series, Karen Marie Moning has always had a penchant for telling us something dramatic and then backing up to explain how Mac got to that point. In Faefever, she takes that technique to a new level: the whole book is the explanation of how she reached that bombshell of a first sentence. Who is this man, and why is Mac willing to die for him? At the end of Faefever, Mac was brought low, her free will stolen by the schemes of the Lord Master and the powers of several Fae. 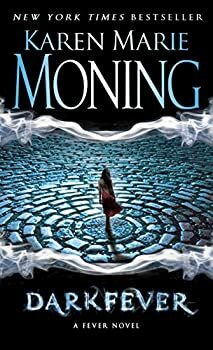 In the early chapters of Dreamfever, Karen Marie Moning makes the unusual decision of switching to another point of view, that of Mac’s teenage friend Dani, who narrates the first few days after the walls between the worlds fall down. Dani’s style of narration can be a little jarring after one is accustomed to Mac’s voice, but these chapters give us an idea of what’s going on in the world while Mac is out of commission. 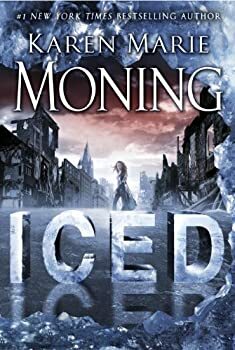 Iced is the first novel in Karen Marie Moning’s new DANI O’MALLEY series, which is a spin-off from her excellent FEVER series. Readers of FEVER know who Dani is — she’s the 14-year-old sidhe-seer that Mac befriends. Besides being able to see the fae, Dani has other superpowers — she moves “super-fast” and has super senses, too. Dani also has the Sword of Light — one of only two magical objects that can kill the fae. Dani lives in Dublin during the year 1 AWC (After the Wall Crash). The wall separating our world from the fae has fallen down and the dark fae are preying on humanity. Dani, with her superpowers and magical sword, can handle this new world, but most people can’t and half the world’s population is dead. Dani does what she can, publishing a newspaper, helping people find food and shelter, and killing as many fae as she can every day.